12 South Korean cryptocurrency exchanges such as Bithumb and Upbit received a pass from evaluations done by Korea Blockchain Industry Promotion Association (KBIPA) on voluntary restraints. KBIPA announced results of its first evaluation done on 12 of its members. Bithumb, Upbit, Huobi Korea, DEXKO, GOPAX, Neoframe, Streami, OK Coin Korea, Korbit, Coinzest, Coinplug (CPDAX), and Hanbitco received a pass from KBIPA. Although 14 exchanges participated in KBIPA's evaluation process initially, 2 of them withdrew from the process later on. KBIPA's evaluation was divided into regular evaluation and security evaluation. Security evaluation was done by intervieweing people who are responsible for security of these 12 exchanges 4 times based on materials submitted by them. 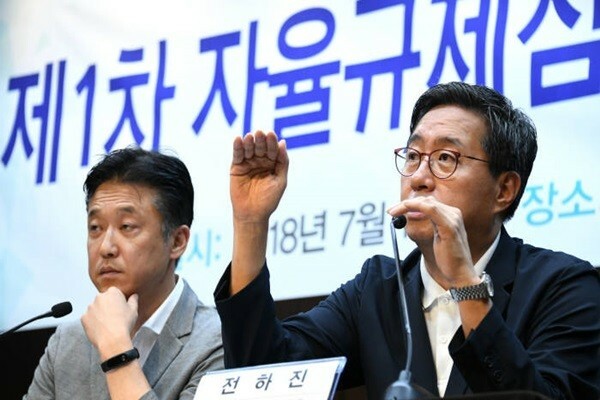 Regulat evaluation looked into 28 items such as equity of more than $1.78 million (2 billion KRW), management methods of holdings, listing procedure of coins, possession of more than 70% of cold wallet (electronic wallet not connected to internet), prohibition of price manipulation, and prohibition of insider trading. "This evaluation only looked at answers for questions that were asked from a checklist." said Chairman Jeon Ha-jin of KBIPA's Voluntary Restraint Committee. "After looking at 12 of these exchanges to see whether they have miminum requirements for security, we have concluded that all 12 of them conform to our standards." However, he elaborated further by saying that there were some deviations on security standards between exchanges. KBIPA did not announce detailed results of its evaluation because it felt that they can be targets of hackers once these results were made public. KBIPA explained that it will continue to perform evaluations in the future. It announced that it will provide detailed guidelines to investors and look into whether it will be able to make detailed information of exchanged public. Also, it emphasized that it will look into unusual transaction detection systems within exchanges, suspicious trader blocking system, joint-responsive system through mutual network of emergency contacts during cyber-attacks, and group insurance by cryptocurrency exchanges to prepare for prevention in advance and countermeasures. On the other hand, some criticized KBIPA for only evaluating its members and not announcing detailed results of its evaluation. "KBIPA did not look at every item that was on its checklist and we did not know that materials that were sent verbally would receive a pass so quickly." said an executive IT member of an exchange that participated in KBIPA's evaluation. "There were also some absurd questions from evaluation panels as they somewhat lacked professionalism in security." On the other hand, KBIPA announced that it will supplement evaluation standards and others in the future to continue to protect people and to make cryptocurrency markets healthier in the future.